Hard work beware. Inside the Adventurer One beats the adrenaline-charged heart of The DRIVE®, the Yamaha vehicle designed not only to be the most comfortable, dependable golf car ever built, but also the least expensive to maintain. Similarities aside, the Adventurer One was built for work. And despite its rugged good looks, the Adventurer is ready to handle your most daunting tasks without even breaking a sweat. So whether you’re watering your newly planted shrubs, dragging the infield, maintaining the campus, moving supplies to the marina or fly fishing in the great outdoors, take comfort in knowing the Adventurer One will work as hard as you do. What if the sun goes down before the work is done? No worries. 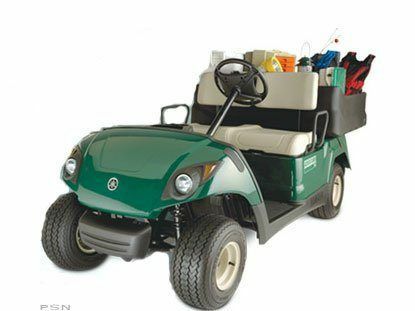 The Adventurer One comes standard with sealed halogen headlights and tail lights to help you find your way back to the cart barn. With a 7.8 cu. ft., 300 lb. payload capacity, pneumatic-assist tilting, fold&nbsp;and lock tailgate and roto-molded linear polyethylene construction, this is where the hard work gets done.